The 550 sports car. 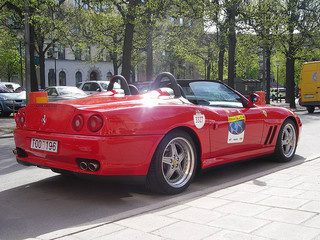 The top-of-the range Ferrari 550 Maranello was launched in 1996 at the Nurburgring racetrack, with its title reflecting the 5.5 litre engine, and the location of the Ferrari manufacturing facility. It was very much based on the four seater Ferrari 456 GT, and was offered in both a two seater GT Berlinetta and Barchetta convertible versions. With a tubular steel frame chassis fitted to a light aluminium body, it had all round independent coil spring suspension, electronically adjustable shock absorbers, and anti-roll bars. There was power assisted rack and pinion steering, plus 13 inch vented disc brakes at the front and 12.2 inches at the rear. It had a computer managed traction control system that consisted of Normal, Sport, and Off-modes. The system would reduce engine power at the first sign that the rear wheels were losing grip. This was complimented by the addition of ABS, which balanced front and rear braking when forces exceeded 0.5g. The front-engined 550 car was designed by Pininfarina, and its styling soon earned it the accolade of one of the classic cars, with more than adequate leg and head room, and a small amount of storage space behind the seats. It had very good handling characteristics, and a drag coefficient of 0.33. Fuel consumption was 13 mpg in the city. It featured a beautifully appointed and spacious interior, with a boot offering adequate room to store necessary luggage. At the 2000 Paris Motor Show, the Pininfarina-designed Ferrari 550 Barchetta sports car was introduced as a 448 unit limited edition to commemorate the 50 year association between Ferrari and Pininfarina. It differed from the GT variant in that it included a lower windscreen, and rollover bars behind the seats. Interestingly, prior to production that began in 2001, all 448 units had been sold. It was an out-and-out open top car, and the folding soft top that was provided had to be operated by hand, and was not meant to be used when travelling above 70 mph. 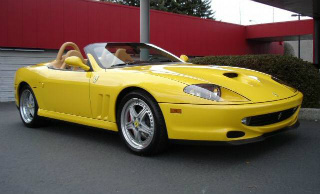 The Ferrari 550 was powered by a 5.5 litre, V12, double overhead cam engine, with four valves per cylinder. It featured a variable length intake manifold, titanium con rods, aluminium pistons, and a compression ratio of 10.8:1. This developed 485 bhp at 7600 rpm, and 420 ft/lbs of torque at 5000 rpm, when it produced a top speed of 199 mph, and a 0-60 mph time of 4.2 secs. It was fitted with a six speed manual gearbox, positioned at the rear, and in line with the driving wheels. Ferrari had no plans for the 550 to be used on the track. However, in 1999, private enterprises developed and introduced the Ferrari 550 GT sports car, and was entered in the FFSA GT Championship in 2001, and the Le Mans race in 2003. In 2001, Prodrive produced racing versions of the 550, but with no support from Ferrari. Designated the 550-GTS, ten units were built by 1995, and the car went on to win the FIA GT Championship in 2001. 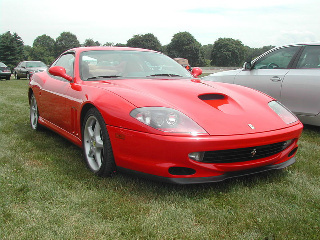 As a result of the success of the 550-GTS, Ferrari modified their 575M for use on the track, and offered it to privateers. In terms of the second hand market, a Ferrari 550 Maranello, in good condition, could command around $80,000, whilst a truly excellent example could reach as much as $160,000. In the Ferrari line-up, this was another of their classic cars.